An organized lifestyle is worth the investment. Working with an individual dedicated to practicing and teaching leading organizing strategies will leave you feeling equipped and empowered. You will save precious time and frustration looking for misplaced items and important documents. To get started, call 218-213-8071 for a FREE phone consultation or email to schedule an onsite consultation. I am happy to answer questions over the phone, but seeing the space is best. Set aside at least 30 minutes for the consult. It will give us a chance to meet and talk about your vision for your space and organizing project. I’m overwhelmed, ashamed & embarrassed. Should I clean up before the consultation? No! Seeing your home “as is” allows me to see how you live and work on a daily basis. Forgive yourself right now! Clients are treated with respect and courtesy: What I see stays with you and me. Client information is confidential. I don’t know what to expect and am afraid I will be forced or pushed to get rid of things. 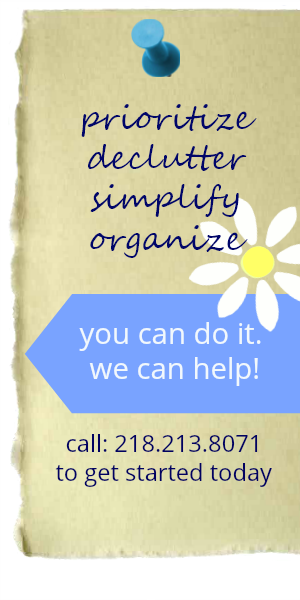 Organizing and simplifying is a process. We will work together and determine what you need, use and love. Together, we will find ways to display or store items that are of value to you. The first step is being a willing participant. Organization is a process and everyone works at a different pace and has a different decision-making process. Time spent is dependent on a number of key factors: volume of space, quantity of items, and the amount of time you can commit to the process and the pace at which you are able to make decisions. Let’s start today! We have one life. Keep it simple.